Upgrade the value of your home with a high efficiency furnace or air conditioning rental in Guelph today! Guelph is so much more than a university town. Despite the more than 50 year history, more than 32,000 students and its veterinary program being ranked fourth in the world, there is so much more to Guelph than its university. From a summer time miniature train and carousel for the kids to a multicultural and dance festival, Guelph is a wonderful place for families. For people looking for a little more cultural experience, Guelph offers museums, historical homes as well as a restored 1940 steam powered locomotive. Brave souls could also attempt the famed ghost walk to hear the chilling local stories. After a walk guaranteed to give goose bumps, residents can cozy up in their homes, thanks to their energy efficient heating units. Despite all these great amenities, the cost of living in Guelph is 7.2 per cent lower than Toronto. With these savings, many residents are interested in energy savings as well. It’s no secret that energy efficient heating and cooling systems can dramatically affect your energy costs, but many worry about the cost of the initial investment. Luckily, there are now more options for those who want to upgrade their system without having to make a large financial investment upfront. There is now a new way to acquire a new energy efficient heating system and central air conditioning unit without any money upfront. In fact, by upgrading you could actually qualify to receive up to $650 in government rebates. Instead of a traditional financing method, you can now choose to rent your system. By choosing a furnace or air conditioning rental in Guelph, Ontario you are getting so much more than an upgraded system. You are getting all the benefits without any of the traditional drawbacks. With furnace rental we work with the highest rated manufacturers. You don’t have to worry about an HVAC company cutting corners with low quality brands. 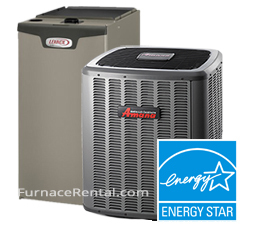 We work with units made by Amana, Goodman, Mitsubishi, and more. We make sure to bring you our best. We try to work with all types of credit situations, as long as you’re the homeowner. One phone call is all it takes to get a new high efficiency furnace or air conditioner in your home as soon as the next day. Installation is free and includes up to 15 feet of duct work. We can even remove your old unit at no extra charge. By choosing to rent your furnace or air conditioner in Guelph you are not only getting a high quality, energy efficient system, you are also getting the protection that comes with your rental agreement. With an upgrade to an energy efficient furnace from an older, less energy efficient model, you have the potential for up to a 45 per cent savings annually on your energy bills. The best way to keep these savings going is to service your system regularly. With your rental agreement, you get complimentary maintenance to keep your system working as efficiently as possible and keep service calls to a minimum. That means regular checkups are easy to schedule and absolutely free and lessen the chance of your system breaking down. It’s a win-win. We all know that heating and cooling systems tend to break down at the most inconvenient times, such as the middle of a blizzard or heat wave. Instead of wasting your time calling company after company looking for the best price from an honest contractor, your rental agreement gives you access to our emergency line, available 24 hours a day, seven days a week. One phone call will get expedited service so that a licensed professional will be at your home, fixing your system sooner. If our service professionals can’t fix the issue, they will replace your unit, for free. So why not give us a call and see how we can upgrade the value of your Guelph-area home with a furnace or central air conditioning rental? The call is free and easy and you are under no obligation. Call us at 1-877-525-9081 or fill out our contact us info and we will get right back to you.